Leading up to Apple's September 12 media event, the exact price tag of the upcoming iPhone 8 has been one of the biggest question marks surrounding the smartphone. The latest rumors describe a premium device that will start at $999 (64GB) in the United States, then rise to $1,099 (256GB), and cap at $1,199 (512GB), although of course none of these price points or storage configurations have been confirmed. 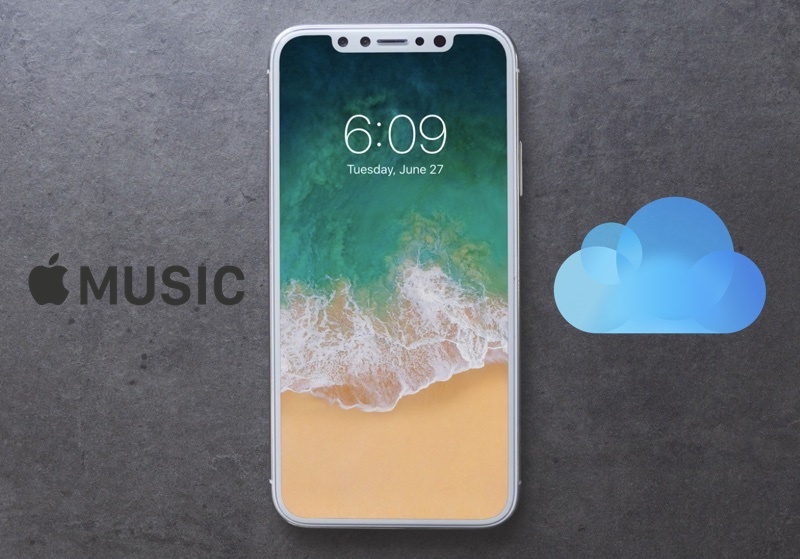 Recently, a team of Barclays analysts including Mark Moskowitz have theorized one potential solution for the device's premium price tag: Apple could debut an iPhone 8 bundle that packs in a year's worth of Apple Music and a 200GB iCloud subscription into the cost of the smartphone (via Business Insider). In the U.S., one year of Apple Music costs around $120 at $10/month (although Apple sells gift cards that knock the annual price down to $100/year), while a 200GB monthly iCloud subscription runs at $2.99/month, equating to around $36 each year. Taken from the cost of the alleged "cheapest" iPhone 8 at $1,000, users would actually be paying about $844 for the smartphone and $156 for the bundled services, which the Barclays analysts said would be "more palatable." 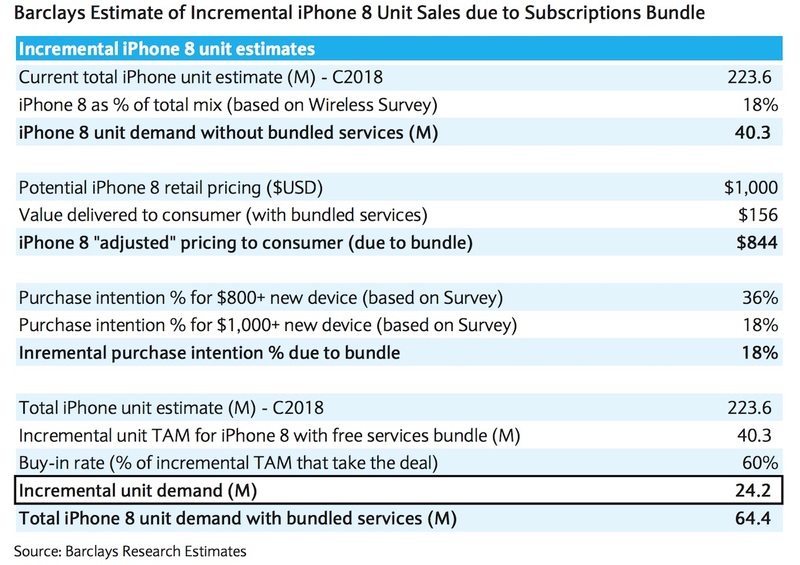 Barclays' prediction is based on a survey of wireless service customers (see results chart below), which found that Apple "might" sell around 40.3 million standalone iPhone 8 devices, but with the Apple Music/iCloud bundle that statistic could jump to 64.4 million iPhone 8 units sold. "Barclays analyst Mark Moskowitz and his team think they have figured that out. Apple will offer free subscriptions to Apple Music and 200GB of iCloud storage for one year, a deal worth $156, to anyone who buys iPhone 8. That will bring the perceived cost of the phone back down to a more palatable $844. While a bundle like this would be a logical move by Apple, locking iPhone 8 customers into the company's ever-growing services ecosystem, Barclays' report is just a prediction and has not yet been corroborated by any other sources as a potential launch plan. In the past, Barclays has gotten close at reporting the facts about unreleased products, but has missed some details. In November 2016, Barclays Research analysts predicted three new iPads would come in March 2017, including refreshed 9.7-inch and 12.9-inch versions and an all-new bezel-free 10.9-inch model. Only a new 9.7-inch iPad launched in March of this year, while a 12.9-inch and 10.5-inch iPad Pro debuted at Apple's WWDC event in June. Analysts at Barclays have made a handful of predictions that can't yet be rated for accuracy since they concern the iPhone 8, including an expected "limited quantity" September launch, the inclusion of a True Tone display, a Lightning to headphone jack adapter in the box, and faster charging thanks to a 10W power adapter with a USB-C connector and an integrated USB-C Power Delivery chip. In a separate report today by DigiTimes, Taiwanese supply chain sources have corroborated many of the current rumors surrounding the iPhone 8's pre-order date and price range. Taiwan is said to be "included in the first group of markets" where the iPhone 8, iPhone 7s, and iPhone 7s Plus will be made available for pre-order, with customers in Taiwan reportedly able to place their pre-order on September 15, the sources said. This date makes sense when looking back at the past five years of iPhone launch history. Like previous reports, DigiTimes cites iPhone 8 prices at $999, $1,099, and $1,199 levels, with storage capacities of 64GB, 256GB, and 512GB, respectively. Samsung's monopoly of the OLED supply chain has been rumored as the explanation behind these high iPhone 8 prices. As is typical with new iPhones, the iPhone 8's launch is expected to be riddled with shortages and shipping delays, and could even ship sometime after the LCD iPhone 7s and iPhone 7s models. Fortunately, we're only four days away from Apple's September 12 event, where the company will reveal more information about the iPhone 8, iPhone 7s, iPhone 7s Plus, 4K Apple TV, Apple Watch Series 3, and more. I'll take it without the bundle. So 200 cheaper right. Stop laughing people. A big nope. I don't buy it. They don't need to give anything away for free, and it hasn't been their style. So are we just supposed to forget the (forced) free U2 album? Fat chance with Timmy at the helm. Just give us something useful like free Applecare+, that would actually lessen the price impact. Apple could reduce the price simply by reducing the amount of profit from each unit! I'd much rather not be forced to pay for Apple Music and a 200GB iCloud subscription. Looks like a classic example of trying to trap users into the Apple ecosystem to me. Why not give users the option to take out these services like everyone else? Come to think of it, there won't be many users wanting the 256GB or 512GB version if they're getting 200GB of iCloud storage and Apple Music included. 64GB users will be stung once their 12 month 'free' iCloud ends, whilst 256GB/512gb users will be stung by shelling out more for their iPhones in the first place. Seems like Apple wins all round. I have no interest in 200GB of iCloud storage or an Apple Music subscription. What if you already have a family subscription to Apple Music and an active 200GB storage plan?